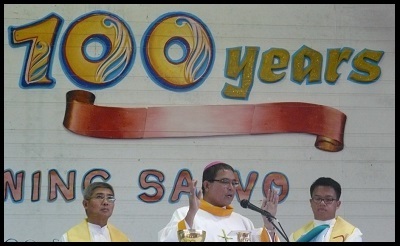 St. Peter’s College, Ormoc of the Manila Priory with a total enrollment of 2, 075 students, celebrated its centennial from February 20-23, 2014. The festivity commenced with the Holy Mass officiated by Bishop Crispin Varquez and two concelebrant SPC alumni, Msgr. Jimmy Villanueva and Fr. Erwin Miro. St. Peter’s Institute was established in 1914. In 1930 the Benedictine Sisters were called to the Visayas for the upgrading of St Peter’s Institute, a diocesan school in Ormoc, Leyte. In 1946 the Missionary Benedictine Sisters took over the administration and the school was renamed St. Peter’s Academy. When it started accepting college students, it became St. Peter’s College. The school and the convent were badly hit by the typhoon in October 2013. Progress is being made on rebuilding after the storm.